01. 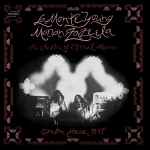 La Monte Young & Marian Zazeela "The Theatre of Eternal Music: Dream House 78' 17""
02. Nurse With Wound "Thunder Perfect Mind"
03. Slum Village "Fantastic Box"
04. Frank Zappa & The Mothers of Invention "Meat Light: Uncle Meat Project/Object"
07. The Pop Group "For How Much Longer Do We Tolerate Mass Murder?" 09. binaria "10th Anniversary Box"
10. Public Image Ltd. "Metal Box"